Have you ever tried surfing? I have. I remember how hard I struggled with the waves at first. Although the waves were not really intimidating and threatening that day as it's not the "surfing season" yet, I was still worried. I was still scared. My surfing instructor was young, but he knows the wave like the back of his hand because he grew up in that place. He was patient with my questions, and was supportive. He thoroughly explained to me everything He knows about the surfboard, the waves, and the tactics in keeping my balance. I told him I was scared but he assured me that I can do it and that I don't have to worry because he will be behind me, making sure that I’ll be safe the whole time. Every time I fall off the board, he would encourage me to do it again and tell me what I did wrong. Every time I could keep my balance, he was rejoicing like a fan. He was ecstatic when I was able to stand without falling after three attempts. My accomplishment was his happiness. I've realized that surfing lesson is so much like our journey in life. Strong waves of trials intimidate us, shake our faith, and sometimes make us fall into sin and leave us hurting. God our Instructor in life, is very patient with us. He guides us, reminds us of what we can do (all things through Christ), call us out when we sin, and cheers us on. He is hurting more than we do, because He feels our pain. He rejoices in all our victory no matter how small it may be. Our accomplishment is His joy and glory. The waves may grow bigger and we may fear that it might swallow us, but God assures us that He will be there and see to it that we are safe all the time. We may fall, but we can always stand up and try again. He will be there pushing our surfboards, shouting instructions and encouragement, rejoicing in every victory. We need not worry because He knows the ocean of life like the back of His hand for He created it. Most of all we should listen to Him when He tells us we can do it, because He knows us more than we know ourselves. Surf on and ride the waves of life! The beautiful truth. Thanks, Tibs. Very well linked about the the waves of surfing and the waves of our lives. What a beautiful post, both your writing and your message. Thank you! Thank you, Kathleen! Great to see you here. This is lovely and resonant. I don't know how to swim, so the thought of waves crashing about me literally or figuratively makes me catch my breath. Equally so, I'm horrible about simply letting go and letting God. Thank you for the fabulous reminder. I've never surfed but you made your point very clearly, and thank you for the positive message! Oh, you should try it. Thank you, Coco! Hi Lux! You surf??? Wow, that's so cool! I don't think I have the core strength anymore, but it sure sounds like fun. I appreciate your thoughts about cheering for each other, and how God does that for us too. I think he is probably our best cheerleader! And I should be like him, encouraging my friends and family, and those around me. Hi, Ceil. I have tried last summer, but that was it. Just ticking off another item on my bucket list. It was fun and fulfilling although the waves were not really that challenging for experts. They were scary for me. But I was glad I conquered my fear. Thanks and have a wonderful December! Thank you, dear Maggie. Have a wonderful day! Cool post, I love surfing!! 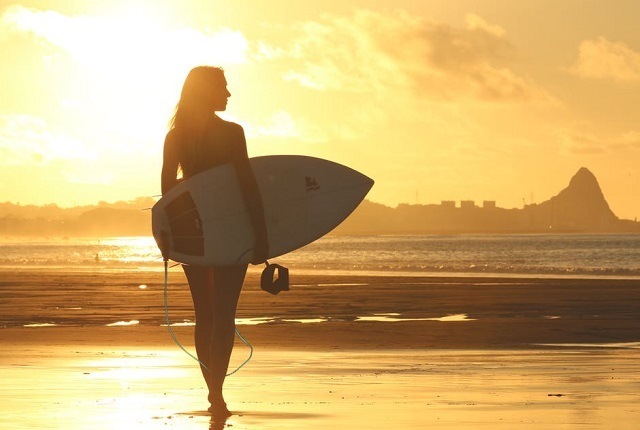 I have never gone surfing before but after reading your post i think i'm going to consider taking some lessons as i am surrounded by lovely beaches and i never take advantage of it. great post. Thank you, Catherine. You might want to consider trying it. It's addicting actually. Oh, I think if I thought to much about surfing..no way would I do it. I guess sometimes, it is best not to think to much and just have faith. Thank for the note. It is best to let the wave take you sometimes. You're welcome. Joanne, you should still try it. I don't know how to ride a bike! So I was hesitant as well. Thank goodness I faced my fears head on and did it. It was such a wonderful feeling. that was enjoyable to read - Never tried it myself but in other things I can relate. Thank you, Sandy. You should try it sometime. Excellent post. Always a good reminder that God wants us to "Hang Loose" because he's got this. :) Thank you for always inspiring me with your words. That's a great way to put it, Chelsea! Thanks for always visiting. This is super lovely...and I would like to try surfing one day. Oh, you should. Thank you, Imogen. I don't think I'm brave enough to try surfing. Then again, I didn't think I was brave enough to tackle so many obstacles, but I road the waves and landed on the shore. Thanks for visiting. Nice to meet you here. I thought I wasn't brave enough for surfing too. Turned out, it's all in the mind. So yes you should try it. Totally agree! Life's a ride on the waves. Thanks, Joseph. I have never surfed. This is such an amazing post, lovely perspective. No I have not tried once in life. It looks like fun sport to try out though! Yes, you should! You're gonna love it. I also don't know how to swim. Well, at I can glide underwater. But the surfing lesson is just near the shore and your guide will be right behind you, so no worries. I am following you on GFC . I hope you can follow me back if you haven't yet. Thank you! How fun. I've only done body surfing, and that was a very long time ago. Oh, I haven't tried that one. You should try surfing then. It's really fun. I am so thankful that God brings me through every season in life. He is so faithful to protect me when the storms hit. Thank you, Nikki. So do you! I wish I had the courage and coordination to go surfing! I'm impressed that you do! Thanks for visiting me! Believe me I am also uncoordinated. I don't even know how to ride a bike! I was just crazy enough to think I can surf (although that day the waves weren't really that big so that's a plus. hehe). Thank you so much for your lovely note! Haha yun pala ang secret ng pagpush sayo para magsurf. I had 3 attempts dn before I was able to stand. After that, sobrang addicting na parang ayaw ko na matapos. Thanks again, Karrie.